Westmead Hospital emergency registrar Dr Phil Smith features in a video as part of a new media campaign to encourage festival-goers to party safely. Revellers will see an increased medical presence at music festivals this long weekend and more explicit messaging, as new harm reduction measures are rolled out. Health Minister Brad Hazzard said the NSW Government will have more critical care doctors, nurses and paramedics on the ground and a blunt warning for audiences. “Doctors, paramedics and a young drug overdose survivor have lent their support to this campaign, reminding people to get help quickly and one pill can harm or even kill you,” Mr Hazzard said. “Tragically, we have had five deaths at festivals in six months, with MDMA implicated in all of them, so we have strengthened our emergency manpower and messaging. The media campaign will play across social media platforms and at all three music events this weekend, reminding people to get help quickly if they feel unwell. 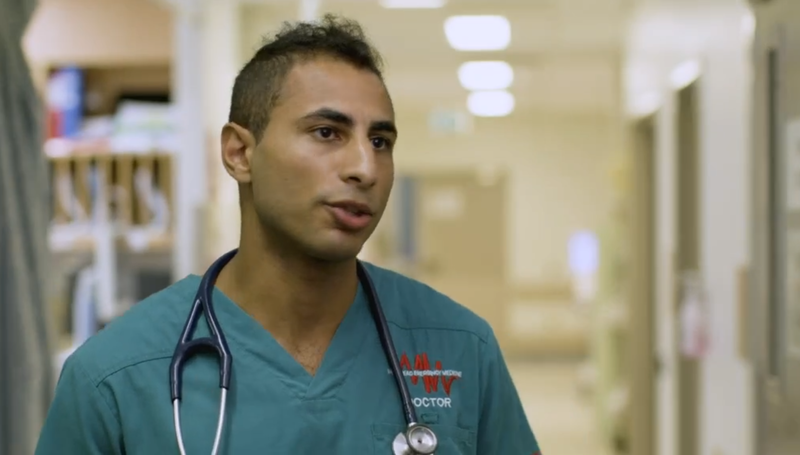 Westmead Hospital emergency department registrars Dr Phil Smith and Dr James Tadros feature in the campaign videos, calling on their emergency experience to encourage festival goers to stay safe. “The clinical picture of when people arrive varies from confusion, nausea, dehydration, bit of a high temperature, all the way through to seizures, bleeding of the brain and death,” Dr Smith said. Dr Tadros said that having to tell people that their loved one has died was one of the toughest things to do. Dr James Tadros talks about his experience treating patients requiring emergency help after festival drug-use. “The hardest part is telling family how things have panned out,” Dr Tadros said. “There’s huge potential in all these people that come in and that’s totally wasted by one decision that they made. Chief Health Officer, Dr Kerry Chant said in addition to more medics on the ground, chill out zones are available so people can cool down, rehydrate, and check in with mates. “If you or a friend is confused, dizzy, too hot, vomiting or has a fast heart rate, get to the medical tent fast. You won’t be punished for getting medical help,” Dr Chant said. “MDMA alone can be a killer but mixing MDMA with alcohol and other drugs or taking multiple doses of MDMA, increases your risk of serious harm. NSW Health’s Guidelines for Music Festival Event Organisers: Music Festival Harm Reduction can be accessed here and for the social media harm reduction campaign click here. Mr Hazzard said, festivals always had to provide health care teams but the Liberals & Nationals Government is now adding the “best of the best” emergency specialists at high-risk festivals.